HONOLULU – The Hawaii Department of Transportation (HDOT) advises Oahu motorists that H-1 Freeway lane modifications will be implemented in the westbound direction between the Pearl City/Waimalu Off-Ramp (Exit 10) and the H-1/H-2 Split beginning Sunday morning, May 3. 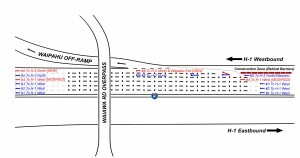 A new right lane will be opened near the Waipahu Off-Ramp (Exit 8B). HDOT will open up additional segments of the newly widened H-1 Pearl City Viaduct as they are completed. Drivers can anticipate a new 400 foot section to be opened every two weeks, weather permitting, until the new right lane eventually meets with the Waimalu Off-Ramp. Four left lanes will proceed to the H-1 Freeway heading westbound at the H-1/H-2 Split, instead of the current three lanes. When the AM Zipperlane is deployed there will be two westbound lanes open instead of one. Two right lanes will continue to the H-2 Freeway heading northbound. Motorists heading to the H-2 should use Lane #5 and can also merge into Lane #6 beyond the concrete barrier walls at the construction site. Motorists heading to the Waipahu Off-Ramp will need to change lanes to the right to Lane #6 past the concrete barrier walls at the construction site. None of the lanes have been narrowed and will remain 11 feet wide. The speed limits have not been changed as a result in the lane shifting. Following the anticipated completion of the overall project in September, all concrete barriers around the work site will be removed, fully opening the new sixth lane. Motorists are advised to drive with caution through the area while familiarizing themselves with the new lane patterns. Weekend and weekday lane closure information will be posted at the HDOT website at http://hidot.hawaii.gov/highways/roadwork/oahu. For more project information, please visit the project website or call the project hotline at 945-1144. Click image above for a larger view. Following the lane modifications, four left lanes will proceed to H-1 westbound at the H-1/H-2 Split, instead of the current three. Two right lanes will proceed to H-2 northbound at the Split. Motorists heading to the H-2 will need to use Lanes #5 and #6. The new Lane #6 will open just after the concrete barriers bordering the construction site. 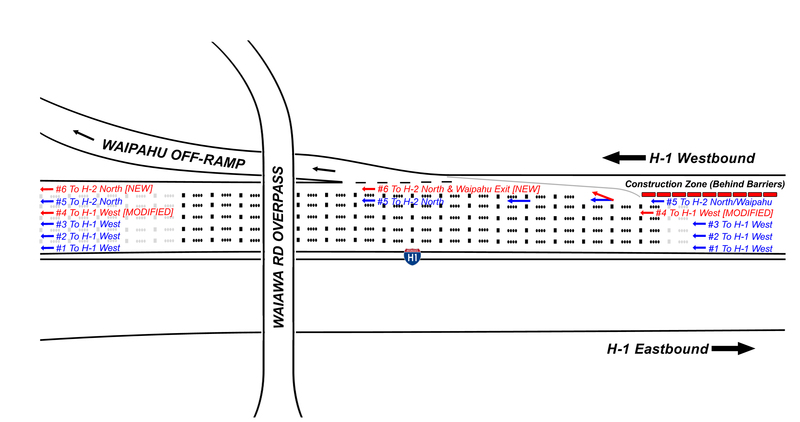 Motorists using the Waipahu Off-Ramp will also need to change lanes to Lane #6 to access the exit ramp.